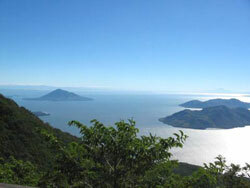 One of the best views of the Salvadorian coast can be seen from the Conchagua Volcano. From there you can also see the islands in the Gulf of Fonseca (Meanguera, Meanguerita, Amapala, among others) as well as the city of La Union. The Conchagua Volcano is located in the department of La Unión, in the municipality of Conchagua at approximately 190 km from the capital city of San Salvador, at 1,242 m ASL. Its name means "narrow valley" in Lenca, even though some authors relate the origin of its name to the story of a fearless woman named Comizahual, which means "flying tiger". 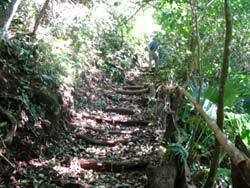 In fact, one of the pathways on the way to the top of the volcano is called "The flying tiger". In order to get to the top of the volcano we recommend you ride a four wheel drive vehicle, since most of it is dirt road. 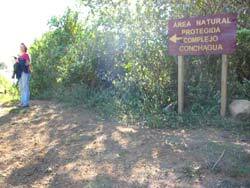 You can access this road from the city of La Unión, or Conchagua. Drive to the town known as "El Faro" where a gate protects the entrance towards the top of the volcano. A person in charge of CODECA (Asociación Coordinadora de Comunidades para el Desarrollo de Cacahuatique) will open the gate for you. We suggest you tip him for his help. In order to prevent any delays you should try to contact with the association before taking this trip. CODECA keeps park rangers who help the preservation of the area, and also provides of a safe area for camping. There are two sightspots in this area. Conchagua, according to the Salvadorian geologist Walter Hernández, is a volcano complex, which divides itself into two volcanic cones: Ocotal to the West and Banderas to the East. Ocotal is the oldest one and it's been modified by several plates; therefore does not have the perfect cone shape. Banderas on the other hand is much younger and therefore well shaped. Both volcanoes have craters but Banderas' is more evident. Local population refers to the volcanoes as "Cerro" (hill) since they elevate on a flatter surface. Much older volcanoes are sometimes not always recognized as volcanoes, due to their shape. For example, volcano Guazapa (older than Conchagua) can not be easily recognized as a volcano unless the person is related to vulcanology or geology. The volcanic complex of Conchagua shares some similarities with the volcanic complex in San Vicente, but the latter one has had more recent volcanic activity, therefore has better shaped cones. If the vehicle you are ridding is not a 4x4, we suggest you spend the night at the property of CODECA, which has running water, since the road to the top is too rocky and steep. Next day, wake up early and take a walk for about 1Hour 30mins to the main sightspot and in 45 more minutes to the second one, through the pathway called "el tigre que vuela".